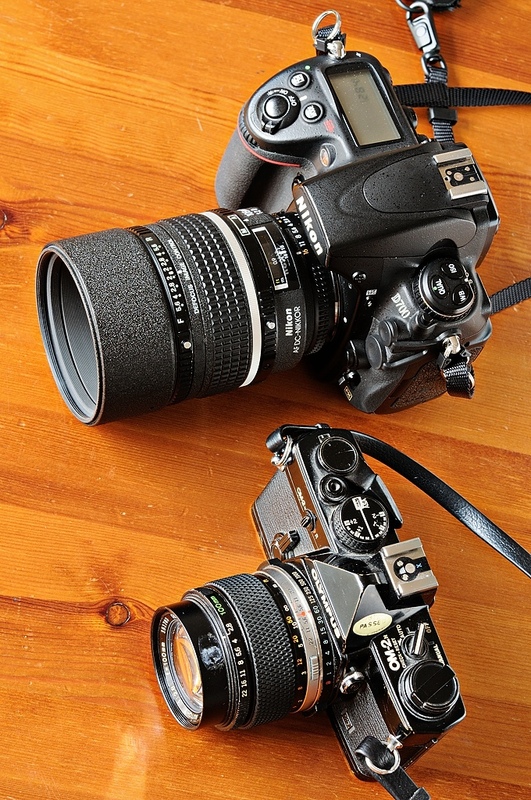 Two cameras with the same size sensors, and 100mm lenses. Anyone who reads the photo blogs can't help be struck by a feeling of "all change". I regularly scan the blogs by a number of photographers whose work I admire, and who, at the time I came across them, all used digital SLRs. If they are in any sense representative, the sands are shifting. There seems to be a disproportionation going on. For instance, Kirk Tuck's businessman's conscience got to him and he cancelled his order for a 1DX and decided to spend the money on marketing instead. Meanwhile he is now using smaller system cameras (Nikon 1 series and Micro 4/3) for some of his professional jobs. Similarly, Thom Hogan makes the point that the smaller system cameras deliver the kind of image quality that got professional work published not very long ago, but without the burden of carrying huge size and weight. Carl Weese on TOP demonstrates that micro-4/3 cameras can yield images capable of being printed at least as big as I'll need in the immediate future. On the other hand, David Hobby has gone in the other direction and decided that digital medium format suits his needs for image quality, without the requirement to machine gun the subject. Digital medium format has long been a mainstay of Lula, and Mark Dubuvoy has just published a very nice essay making the point that even with smallish output, medium format is likely to beat smaller formats every time for quality. So maybe, things really are changing. Where digital SLR's reigned recently, the small system cameras are an alternative with the real benefit of small size and weight. And medium format retains an unchallenged appeal for those who really need the ultimate in quality (if you don't have to ask the price). All this prompted me to get out my OM2n from the box it lives in, at the back of a cupboard. At the moment, it comes out a couple of times a year for me to run a few rolls of B&W film through; and then I put it away again when my jaw sags at the price per frame of developed film. Putting it up against my recently acquired D700 made my jaw drop as well. How have we got into this situation? The D700 is a monster by comparison. A brilliant camera, vastly more capable in pretty much every respect than the OM2n, but just a monster in size. When I bought my OM2n in the early 80s, I chose it because I knew I was going to the Himalayas fairly soon after and wanted something small and light to carry. At that time, the prevailing design theme was to make small, light, robust cameras for serious photographers: Nikon FM/FE, Pentax MX/ME, OM1-4 etc. But with the advent of digital, the idea of the small, lightweight, robust serious camera seems to have got lost. The sensor in the D700 is the same size as that in the film cameras I've listed here. The D300 is another "serious" camera, but with a smaller sensor, and still about the same size and weight as the D700 (well, a bit lighter but not much). Why do they have to be so big? I'm not picking on Nikon alone: Canon and Sony's full frame cameras are pretty similar in size. The other reason that all this comes to mind is that at New Year I went for another potter in the Embankment area with a bunch of Leica Luggers. I borrowed my friend’s M4 with a 50mm Summicron. Smaller, lighter and more discrete than the D700. But then again, my film days are mostly (even if not entirely) over. Nevertheless, the D700 seems to me to be inescapable. Wonderful image quality, reliable and fast focusing with the ability to accurately track the subject. Somehow, I can't see myself with a Nikon V1 attached to the end of the 200-400 mm zoom at Fairford. For the moment, for me, the digital SLR remains the essential minimum. But with the advent of the compact system cameras (Sony NEX, micro-4/3, Nikon V1) things are changing. Not full frame sensors yet, but maybe one day. The Leica M9 is a lovely compact full frame mirrorless camera, but unfortunately, I have to ask the price. Now, it may have a small sensor, but how about the rumored OM-D?